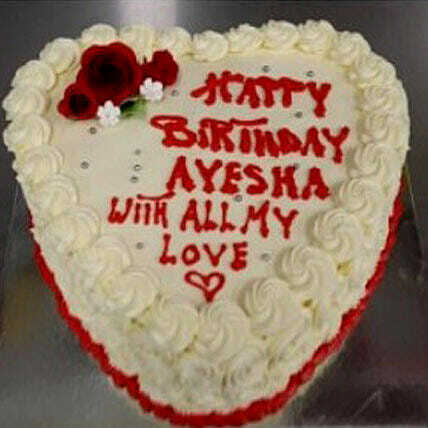 It is time to treat your beloved partner in the most loving and sweet manner by ordering this 1 Kg Heart shaped Vanilla Cream Cake on the special occasion of Valentine’s Day. It comes with the smooth, rich and velvety taste with the unmatched aroma of Vanilla that is hard to be ignored. Delight your loving girlfriend or boyfriend like never before and add sweetness to your love relationship. Store cream cakes in a refrigerator. Fondant cakes should be stored in an air conditioned environment. Slice and serve the cake at room temperature and make sure it is not exposed to heat. Use a serrated knife to cut a fondant cake. Sculptural elements and figurines may contain wire supports or toothpicks or wooden skewers for support. Please check the placement of these items before serving to small children. The cake should be consumed within 24 hours. Enjoy your cake!